Is it possible for the image in the header to be changed? Nice template. Is it possible to change the color scheme from purples to blues and greens? Thanks! Hi, I’m using this nice template but i’d like to add the same links under the header, that I see in this demo. How can I do? Can I also have the same frames and links that appear on the right sidebar? how?? loren merlin… to get the links at the top and on the sidebar you just need to go to layout then page elements and then click the edit on the section you want to add the links to. How do i use this template, it’s awesome but I’ve just started using blogger.com and have no idea how to put this template onto my blog? Nancy, all you have to do is download this template by clicking download at the top of this page. Then go to blogger then Layout then edit html. Next click the browse button and look for the file you downloaded (something.xml) then click upload and it should be your new blogger template. what a very nice template you have, i will explore and see if i can adjust some to my liking. Thanks! I love this template but when I am on a post page, the “Next” and “Previous” links are shown as Anteriore and Recente. My language is English in blogger. I searched for these words in the Edit HTML but could not find them. Where is this coming from????? I tried to install the template on a temporary blogger account it looks awesome except one minor(?) problem. I did a sample post and my title does not fit well in the designated area. The title is 36chars long and it only shows about 34chars. How can I fix this? Is it possible to do line break? I love this template but I’ve encountered a problem. I set my formatting setting to show 2 posts. There are no “Previous” link to show my previous other posts. hello, i am using your template, your template has 4 mini posts on the body at Main page which shows the 4 latest posts right? I have edit the template so that i have 200 latest posts on the body at Main page. And I label 100 out of the 200 posts as People, then I have create a sidebar widget to list out the label. when i click on “People” on the label list. It shows only 20 posts, how to make it shows 100 posts? I mean I don’t want to have “recent” and “older” link on the page, I want to have all of the posts that label “people” display within 1 page. I saw the url shows “max-results=20”, I want to change it to “max-results=100” but when I search the word “max-results” from the html code, it returns 0 result. This template is exactly what I’ve been looking for but Blogger won’t let me upload it, says that it isn’t parsed or something like that. How do I upload to change the header background? I do not see “layout” at all on the dash board. What are you talking about? I have got templates. I can pick but not upload… now how come?? like this theme,may i use it on my blog? n change d pict? @Sesha, 1 – go to create new blog then pick any simple template, then insert adsense widget to the top of the blog. 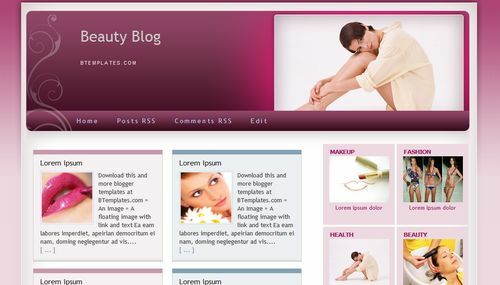 2 – go to edit html, tick expend all widgets, ctrl+f to search keyword “adsense” then copy the whole code about the adsense widget and paste them into your original blog that using this beauty-blog template. Then you will be able to add any widget on the top of this template. Please do the same steps above for the side bar. Is it possible to get the previous and next articles links on the bottom on the front page. Sorry, this website not allow me to post xml code. so i try to make some change on the syntax in order to show the code here. I change the symbols of to ” and “. I like the theme but when I added the pages widget it wont open in full. I would like to put certain info there, how do I go about it. 1 – Reduce the width of the widget. 2 – Expend the width of the sidebar. how to i change the 4 mini post back to normal post ? mean i want back the original blogspot post size and style. @coolman. Go to Html editor, tick expand widget templates. I want to link those 4 images to my ‘static_page’. How can I display those ‘static_page’ just like ‘item’ ? @ty. On Deshboard, click Layout, click “Edit” link on Makeup. Type in the link of your static page on the “link” field. I think the comments feature is broken or disabled… Has anyone else experienced this? Or if you know a fix, that would be great. I really hate to change my template, but I really want to enable comments. Thanks! I don’t know what is the problem you have. I already checked your blog, and I saw the embebed comment form under each post. Thanks for the fast reply and for checking. Yeah, the form is there but the functionality is not. It doesn’t save or post the comments. Does anyone have a working comment feature? I don’t have a clue why mine wouldn’t work unless there is a bug of some sort, or if I was supposed to do something special to set it up. I’m not sure what else to try. It think that the problem is with the word verification. Claudia, you are the best! Thank you very much. It is now working!!! Very nice design! But I have some problems I hope you can help us with. 1. When we open the link on the top “om oss” it shows just some of the text, and it is not possible to open the full story. 2. The headings at the blog posts is a bit to big, how can we customize? 3. Some of the pictures gets “squeesed”, how can they maintain their original propotions in the small pictures? 4. How can we have more posts on the front site? Please answer us in e-mail! Thank you very mch! Anyone that can help us with this template? 1. When we open the link on the top “om bloggen” it shows just some of the text, and it is not possible to open the full story. 2. The headings at the blog posts is a bit to big, how can we customize? Sometimes the headings are to long for the boxes. 3. Some of the pictures get “squeezed”, how can they maintain their original proportions in the small pictures? Why you didn’t approve my comment? I spend time to write comment to help him, why you didn’t appreciate it? I love this template, but when I download it three large icons with the screwdriver and spanner are there. Please help!!!! What’s is your website Catrin.